When I went to my last full medical check-up in 2015, I was walking 10,000 steps a day, eating very healthily and feeling on top of my game. However, on the annual anniversary of the check-up in 2016, my angst increased because I had done hardly any exercise during the last year, spending too much time in the office and delivering a challenging cultural change project. I had also started writing my first book and had changed my daily work regime. However, I had made a few small health changes and I underestimated their beneficial power. I had started to meditate and use a daily gratitude journal after the first check-up. My typical day now starts with two meditations; Headspace© to focus on my breathing and clear my mind; followed by a guided meditation to pay gratitude to the wonderful people in my life and visualise the type of day I want to have. This takes about twenty minutes in the morning and I do it while the house is still quiet. Some days I only have time for one meditation due to the challenges of my working schedule. In the evening, I close the day by capturing additional thoughts of gratitude in my daily journal. I focus on at least ten things I am grateful for throughout the day. When I encounter a challenging conversation or incident, I write it down and express my gratitude for the learning, growth and development resulting from it. Sometimes, I skip the journaling at the weekend and after two days I feel a dark, grumpiness settling over me. After writing in my journal I play a recorded meditation, which I normally fall asleep to. Gone are the days of using Kalms (a natural sleep remedy) to switch my mind off and force me into a dreamy place. It is almost as if the journal provides the necessary closure to the day and allows a more peaceful sleep to take hold of my body. 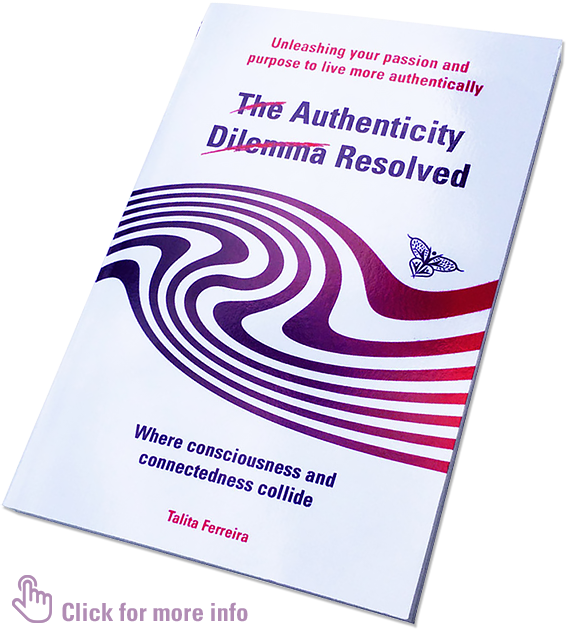 The cultural change project, I managed in my corporate role and several other coincidences, led me to research the concept of authenticity and I started writing my first book, The Authenticity Dilemma Resolved®, published in November 2016, London. However, because I was in a very demanding corporate role as Chief Financial Officer, I had to make the time to write my book. I decided to go to bed earlier in the evening and get up every morning at 5am. After my ritual meditation, I wrote for 60 to 90 minutes and then got ready and drove to work, which was luckily only a ten-minute car journey away. I managed this new ritual of early to bed and early to rise extremely well. The result was at least seven and a half hours sleep per night, which before had only been a dream. I absolutely aced the second medical check-up, especially the breathing rhythm test. My body condition was better with no exercise than it had been previously with 10,000 steps a day. The daily meditation and journaling regime and the consistent hours of sleep, had created an unexpected beneficial change, I had not anticipated. Sometimes, we are surprised to find better wellbeing in the most unexpected places. Small incremental change can have a big impact over time.